It began 40 years ago, the Mothers of the Disappeared, the `madres of the Plaza de Mayo’, circling the square, in white head scarves demanding answers as to why their children had `disappeared’. Argentina’s `dirty war’ tore the country apart as it did others (like Chile) in the mid 1970s when Marxism, `liberation theology’ and right-wing militaries fought for supremacy in Latin America with devastating results. In Argentina, the `junta’ (with the aid of the CIA, busy throughout Latin American at that period) took drastic action against any kind of liberal resistance. Protests by students and others resulted in thousands of young people being arrested, tortured and, horrifically, thrown from planes into rivers. 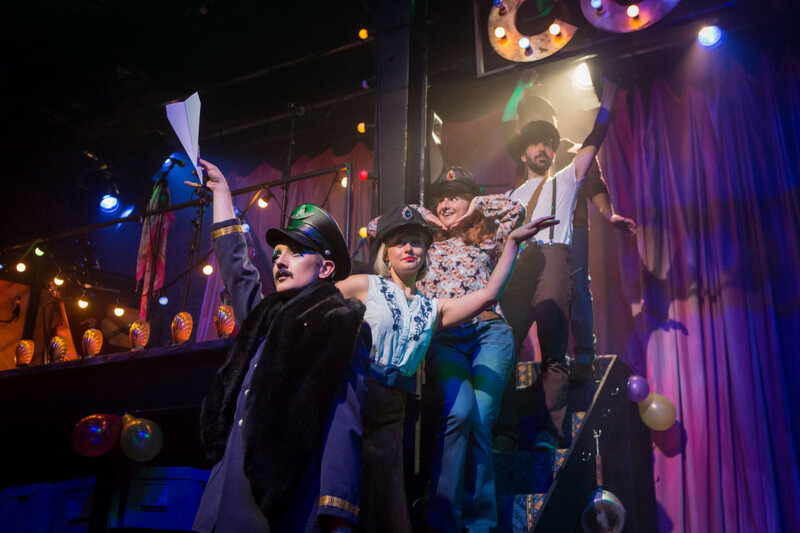 Out of this most gruesome of recent histories, director Amy Draper (who lived in Buenos Aires for a year and was inspired by what she saw there) has carved out a charged, powerfully resonant political cabaret. Clearly taking her cue from Ebb and Kander’s Cabaret, Draper frames her story similarly through a revue/nightclub setting. 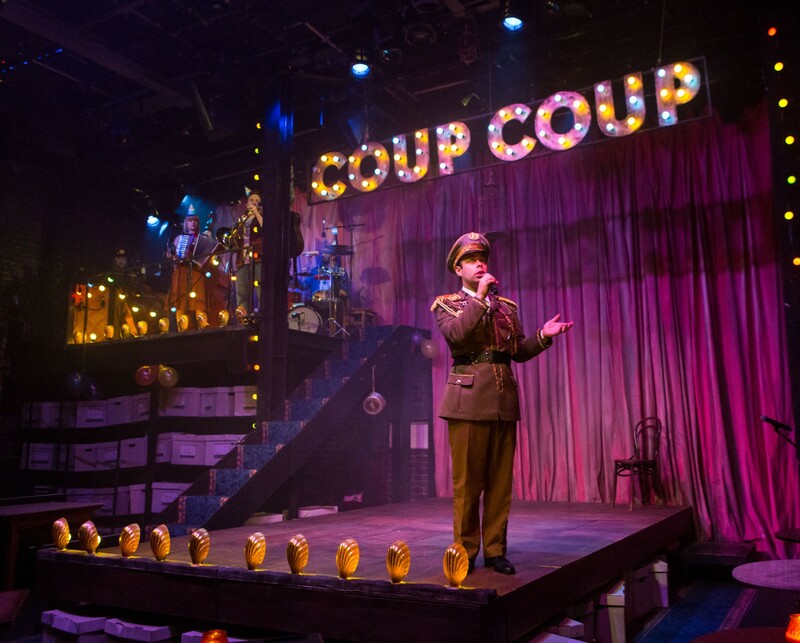 Instead of Cabaret’s Weimar Kit Kat Club we have the Coup Coup Club (sic!) and a generalissimo master of ceremonies (Rob Castell) with a heavily sequined drag queen (Alexander Luttley) to point up the grotesquerie. Draper’s framing `cabaret’ has the benefit not only of casting what is to follow in metaphorical terms but also serves palpably as a way of drawing in the audience. The general’s `cabaret’ line-up for example includes a `Naval’ commander/magician/hypnotist (Neil Kelso) gleefully engaging the audience in card and other mind-tricks. It all serves to soften us up for a second half in which the story of what happens to one daughter, Ana (Charlotte Worthing) and her mother’s reaction takes the darkest turn and is woven into verbatim clips of victims’ testimonies and a recent trial in which the General chillingly declares `he would do it all again’. 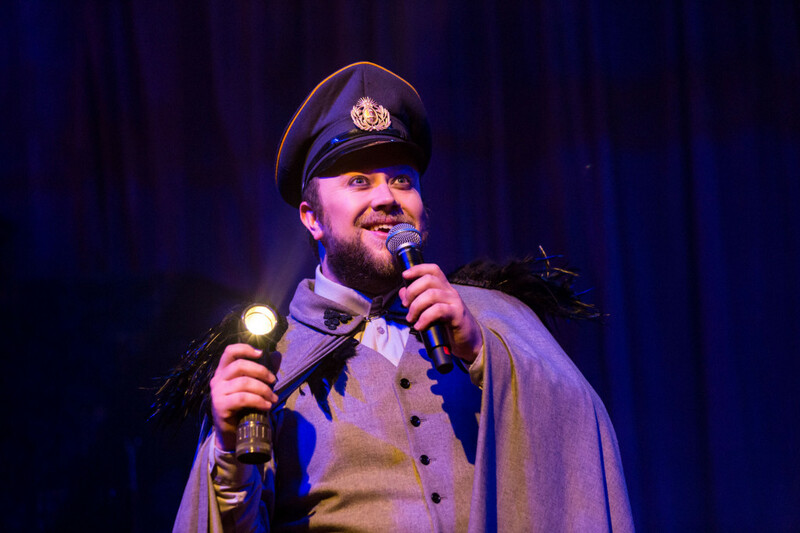 Like Lloyd Webber’s Evita, imagining herself the `mother’ of the nation, composer and lyricist Darren Clark cleverly and rightly picks up how the Argentine’s General’s rationalisation for brutality is played out with a perverted sense of paternalism and defence of the nation. As a `father’ to all `his’ children, he carries beguiling appeal in Rob Castell’s monstrous but engagingly smiley dictator. But the real triumph of the evening – and it is a slightly over-long evening in what are difficult conditions in the Arcola’s non air-conditioned space – is indeed Clark’s musical invention that draws its inspiration across a range of Latin American/Argentine rhythms and styles and is played with sensational passion, virtuosity and sensitivity by musician/singer-actors – Anne-Marie Piazza, Josh Sneesby, Rosalind Ford and drummer-percussionist Eilon Morris. They are the drivers of Draper’s production and Clark’s music and lyrics where horror finds satirical/ironic expression in upbeat songs like The Coup Coup Club, The Father of the Nation and sorrow in Nunca Mas, My Little Bird, The Ghosts of Buenos Aires and En El Fondo Del Rio. Ellen O’Grady as Ana’s mother too embodies all the grief and dignity of mothers who forty years on still do not know what happened to their dear `disappeared’. A magnificent, sobering, entertaining indictment that makes you want to cheer and cry with rage at the same time, its relevance is not least in the light of our own recent tragedies, political and civil. First perf of this production of These Trees Are Made of Blood at Arcola Theatre, London, June 14, 2017. Originally produced by Jim Croxford for Theatre Bench at Southwark Playhouse. 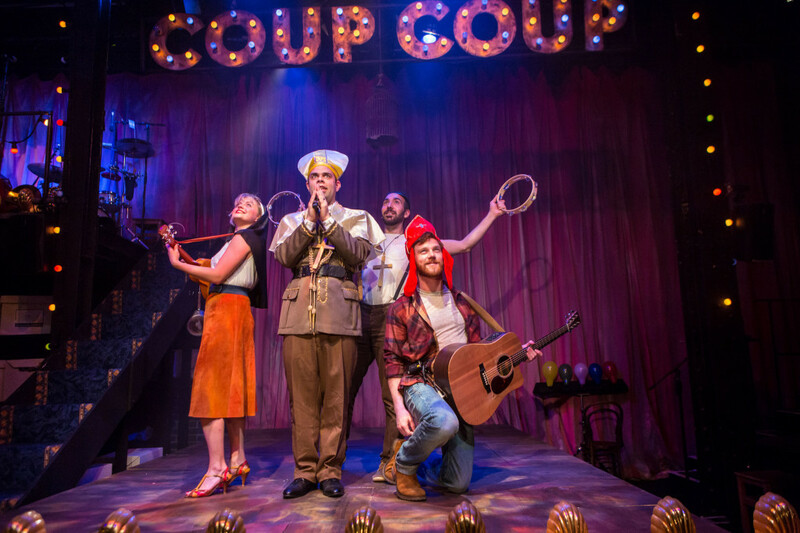 This entry was posted in 2017, Reviews and tagged Amy Draper, Arcola Theatre, Argentina's `dirty' war, Cabaret, Darren Clark, justice, military junta, mothers of the disappeared, Paul Jenkins on June 19, 2017 by Carole Woddis.